In this article, we’ll talk about how to create and take care of an “informal” hedge. 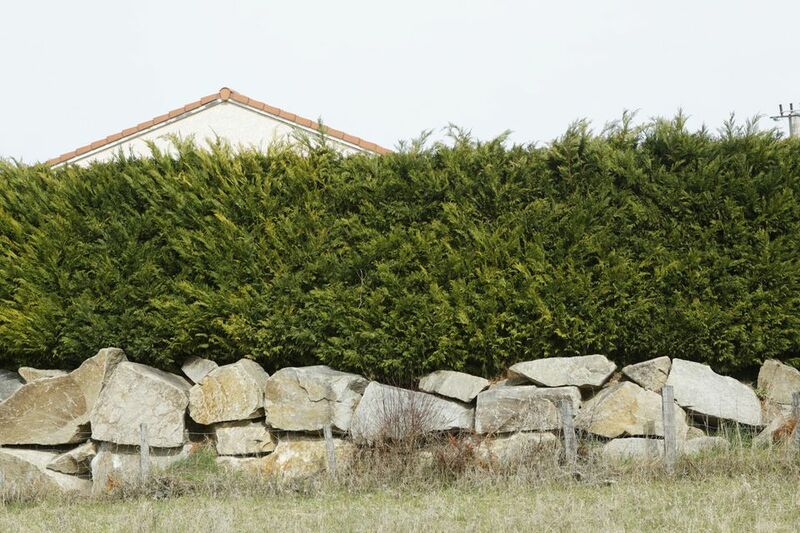 This kind of hedge is meant to appear like a solid wall of some height, and in this way is similar to a formal hedge. It differs in that it has a rougher appearance versus the very smooth, carefully cropped sides of formal hedges of boxwood, yew, Japanese holly, and other plants. We’re going to keep this real simple because that’s how an informal hedge was meant to be: plants close together, suggesting a big shape as a mass, but not perfectly cut to that shape. Informally, we get a little less shape and a little more of the plants’ character. Informal hedges can happen by accident, when you sort of give up on pruning a formal hedge as often as you used to. But there are also good reasons that you would choose informal versus formal. My favorite reason is that you can use almost any vigorous shrub in an informal hedge, instead of the five or so good plants for formal hedges. This opens the way for a lot of creativity, seasonal variation, and surprise, all with fewer yearly rounds of pruning. For your hedge, you will want to work with just one species of plant, and preferably one variety of it. Need inspiration? A botanic garden is a great place to go for ideas of inventive hedge plants. The Morton and Arnold Arboretums both have collections of hedges on display. Using one plant type ensures that each plant behaves similarly, growing at the same rate, shape, and blooming and fruiting at the same time. Of course, every rule was meant to be broken and I love experimenters, but keep in mind that hedge-making is a five-plus-year experiment. At the nursery, buy plants that have lateral branches from their top all the way to the ground. The denser the plant, the better, top to bottom. Your hedge plants are meant to grow together, to touch and interweave. They should grow into each other in the first year after they overcome transplant shock (trees can be in shock for a year or more, shrubs usually shouldn’t go into shock). Mark out a straight or curved line for the hedge to follow. Plant in a single line along this. How close? Tough to generalize. Smaller plants go closer. My rule of thumb: when you back far away from the placed plants, the line should look like an area that no one is supposed to walk through. Another option: plant in a zig-zag along the line. This makes a thicker and better-filled hedge but takes more plants (and money). It’s a great option if you are starting with rather young and small plants. Space close enough that when you view the hedge directly from the side, you see no spaces between plants. For the first year, leave your new hedge alone. Let it grow. Imagine a long mound or a wall with slightly up-sloping sides. Either way, your hedge is flat or nearly so on top, narrowest at the top, and widest at the bottom, even if only slightly. Step back and find the branch that most leaps out of the planes of that shape, soling the look. Cut that branch with a heading cut back to a node out of sight within the hedge. Don’t make a visible cut at the hedge’s surface. Repeat step two and 3 until you feel no more cuts will get the hedge closer to the right shape and size. Try to have your hedge in full sun. It will be fuller and more even. When a hedge gets more light on one side, the lighted side needs to be cut back deeper and more often. Keep your hedge narrow enough that you can reach across to its middle without a tool. By just using selective cuts and not shearing the whole outside, you will have some flowers and fruits no matter which time of year you prune. But if you have a flowering hedge, try to cut summer-bloomers in early spring and spring-bloomers after they flower.